What is a Wisconsin Month to Month Lease Agreement? Wisconsin Month to Month Lease Agreement: What Is It? In Wisconsin, a month to month lease agreement is a legal contract that a landlord uses to establish a short term agreement with a tenant. In these agreements, a landlord and tenant come into an agreement that there will be an open-ended tenancy that can change from month to month. These agreements renew at the beginning of each month, making them essentially indefinite until either the tenant or the landlord decides to cancel the lease. This type of agreement is beneficial for both landlords and tenants in the sense that it offers great flexibility without a long term commitment and can range from only one month to years. Once the landlord or tenant wishes to terminate the lease, a termination letter must be sent at least 28 days in advance. 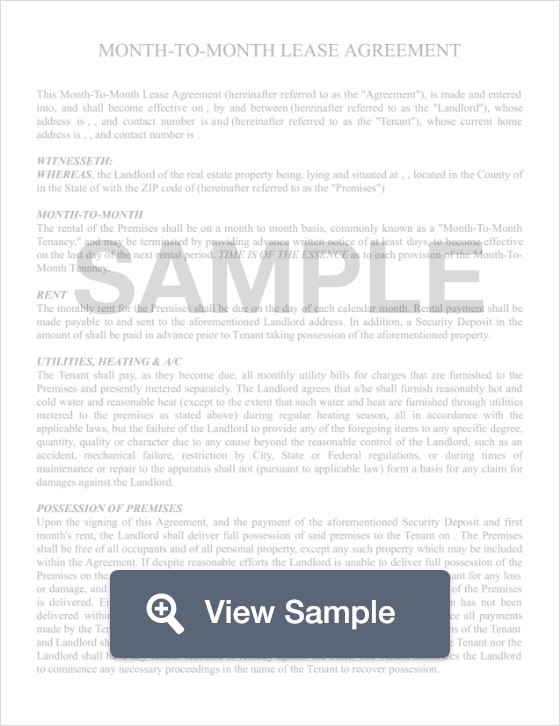 Month to month lease agreements, also known as a tenancy at will agreements can be broken with a termination letter delivered to the opposite party. In order for these agreements to be terminated, the termination letter, or Notice to Quit, must be delivered at least 28 days in advance.